Week 11 Oregon State Legislative Update – Brought to you through our membership in OSCC. We want to reiterate four major tax hikes are being pushed by legislative leaders which total over $5B in a biennium. As of now, all four proposals are serious and viable. Please get familiar with and distribute this infographic. It is the story of the 2019 Oregon legislature. Health Care Tax (HB 2269), aka Employer Assessment Tax ($500M). This proposal would give the Oregon Department of Consumer and Business Services (DCBS) the authority to determine what every large employer (defined as 50+ employees who work an average of 8/hrs per week) should be spending on health care for employees and authorizes the agency to levy a tax on every employer that does not meet the agency’s minimum health care spending requirements. Agency leaders testified that the bill is designed to raise $500 million per biennium in new taxes. OSCC strongly opposes this bill and joined other business associations in written testimony. OSCC was not allowed to testify in person. The bill now resides in the House Revenue Committee. Paid Family Leave (HB 2005) – $1.5B. Legislative leaders have now introduced this bill as the newest and most refined effort to pass a paid family and medical leave system. Bottom line: the bill gives the Employment Department the authority to levy up to a 1% payroll tax on employers and a 1% income tax on employees to implement a 26-week per year paid family leave program. The bill would apply to all employers with at least one employee, guarantees employees position upon return and non-payroll benefits must be paid while on leave. The bill raises about $1.5 billion in new taxes every biennium to fund this new state-run bureaucracy and insurance program. See our letter to legislators on a similar bill that we sent recently. Cap & Trade (HB 2020) ($1.1B). The newest re-write of HB 2020, the ‘Cap & Trade’ bill, did nothing to alleviate cost concerns for manufacturers or everyday Oregonians. The new version of the bill would immediately add 16 cents per gallon in fuel costs and an immediate 30% increase in natural gas costs for residential, commercial and industrial customers. Large manufacturers will see similar and immediate cost increases for electricity. All told, we are analyzing this bill as a $1.1 billion increase in costs for Oregonians each biennium. The vast majority of direct costs will be borne by manufacturers. HB 2020 will result in an immediate 30% increase in natural gas costs and a 16-cent per gallon gas price hike. 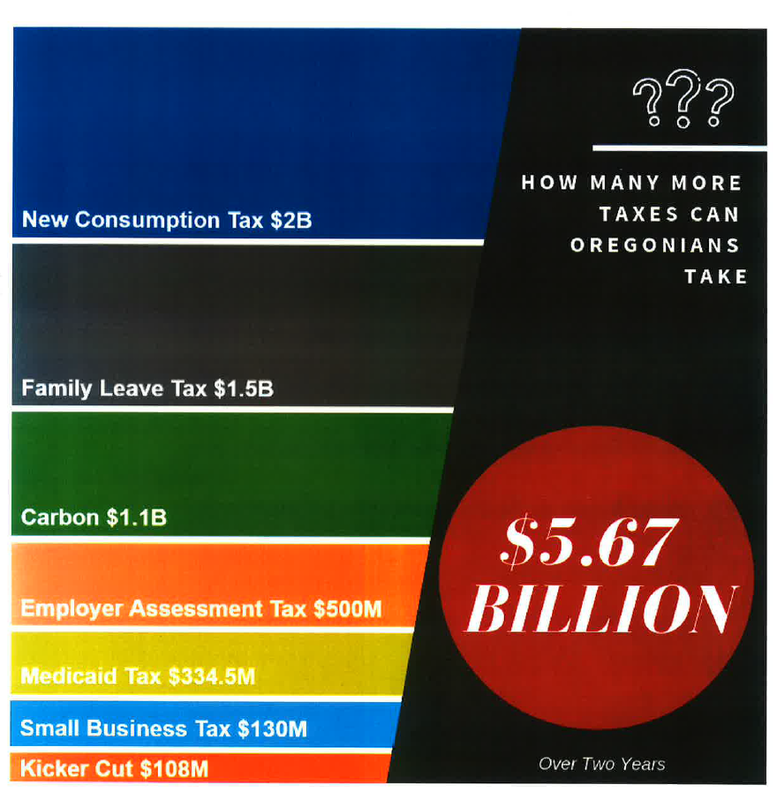 Business Tax Increase ($2B). It’s becoming clearer that leadership will lean toward selecting a Commercial Activity Tax, which is a pure gross receipts tax, as the basis for implementing a new business tax on business to add more than $2 billion in revenue each biennium into the state’s K-12 system. Most models of this tax, start at businesses with $1M or more in receipts (gross revenue), not income. Those lower would have a flat rate applied. There is a small direct offset to resident with reduced state income tax rates. At this point, it does not appear that PERS reform or any other government cost savings will accompany this tax proposal. This equates to about $1,417/resident in Oregon and when compared to the total budget of $23.8B, is a 24% increase on the total budget.